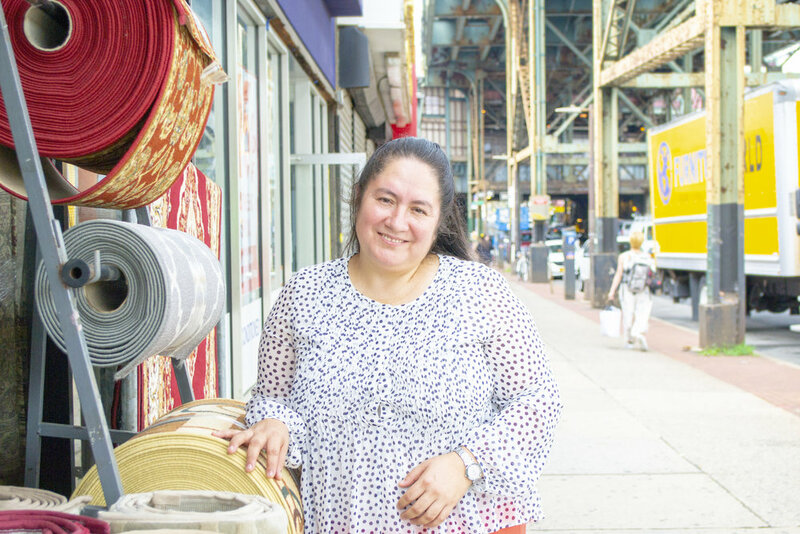 Irene has had Eli & Eli Carpet in Queens, New York City, for 15 years now, and the store has nearly reached capacity; it’s overflowing with rolls of carpets in various colors, patterns, and fabrics. A member of Grameen America, Irene has been receiving microloans for more than three years and is on her seventh loan. With these funds, she has been able to expand the range of carpets she offers. In 1994, Irene came to the United States from Ecuador. To make ends meet, she began selling cookware, but she had studied business administration in school and wanted to start her own store. Soon enough she made this dream a reality. She and her husband, who had experience installing carpets, decided to purchase a carpet store. They meant to name the store “Elohim,” which is Hebrew for God. But they accidently registered the name as “Eli” instead. The name stuck, and they didn’t want to pay to change it. Irene’s business is doing well. She has customers from all five boroughs of New York. She sells both residential and commercial carpet, though commercial is a more popular seller. Her husband does the installation while she handles sales. She currently has two employees who help with installation and stocking. She also has two children, a 23-year-old girl and an 18-year-old boy. Both are students, and Irene hopes they will one day come work in the shop. Her daughter, whose English skills are stronger than Irene’s, helps her write the estimates for customers.